EL Tape is versatile electro-luminescent strips that give you the same flexibility of an EL wire but with more width for even bolder lighting designs. They’re totally flat and give off bands of bright illumination, perfect for highlighting the inside or outside of your modded case. EL Tape has the ability to provide unique solutions for lighting walkways, staircases, or outlining shapes and creating lines. 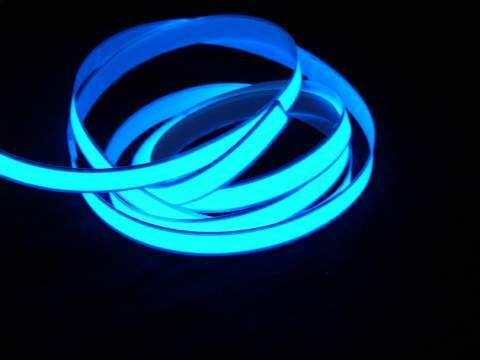 EL Tape is the big sister to EL wire – it has the same glow effect but with a flat shape instead of a round shape. This is a big roll of flexible plastic coated with EL material so its like one big glowing strip. EL Tape emits an even glow over the entire shape. The glowing part of the strip has a plastic coating and is covered in what seems to be PVC, the El Tape is thus weather-proof – but note that the connectors are NOT waterproof, just a bit of heatshrink. EL Tape comes in large rolls that are between 1/3″ up to 24″ in width. The measurement includes the EL Tape’s border which is narrow and sealed to join the front and back together. The length of EL Tape can be up to 50 feet long, but is able to be extended using special connectors. The El Tape kit also has a dual-inverter so you can pair up two EL Tape strips to create the extreme effects you want. The entire length of the strip has an adhesive backing making them easy to apply. The flexible ability of EL Tape makes it perfect for attachment to almost any curved surface. The EL Tape isn’t something we would suggest leaving outdoors for extended periods. You can attach it by sewing through the clear plastic edging, or gluing the back to a flat surface. It is flexible but will crease and damage if folded. You can cut the panel up as long as the shape you cut out is continuous and has the JST cable attached. This panel is a blue-green/aqua color when lit and is the brightest of the panels as it is the ‘natural’ color of EL Tape. Like all EL products, an inverter is required to operate the panel because EL tape has more surface area than wire, it requires a more powerful inverter. We suggest you use a 4xAAA inverter which is strong enough to power a single panel at once – plug it in and turn it on! For more permanent installations, the 12V EL inverter can also power a single panel and run off 8xAA batteries or a wall adapter.